In the 1876 Atlas of Cumberland County, on the map of Millville, is a sand pit and 200 acres parceled off for S. Hilliard. 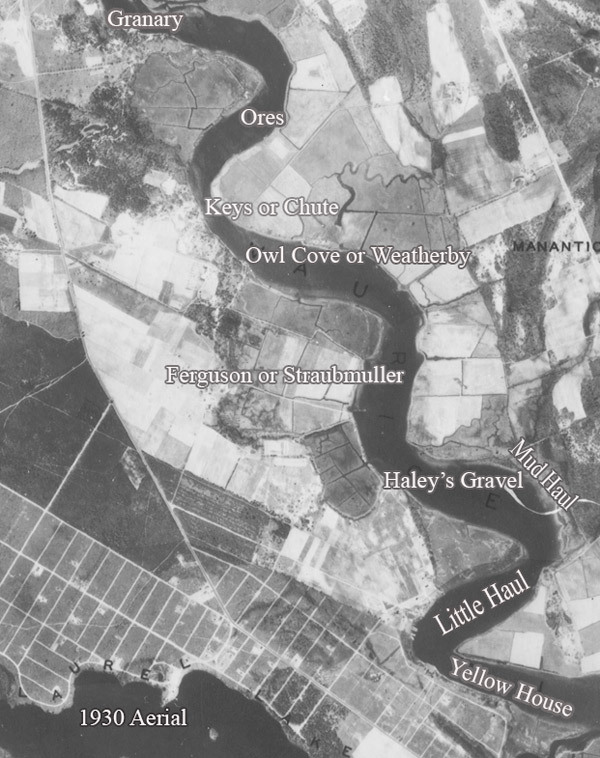 This tract is on the western shore of the Maurice River, right across from the mouth of the Menantico River (spelled Manantic on this map). On page 44 of the Atlas, in the Business Directory, S. Hilliard is listed a "dealer of glass sand." On page 62, there is a sketch of a business, with a caption naming Hilliard as the proprietor of the "Celebrated Glass Sand Pits." 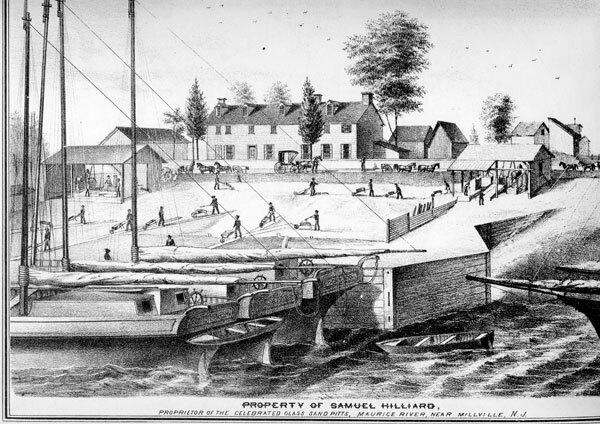 In a handwritten account by Clarence Pettit, dated August 1887, Petit makes an observation about Mr. Samuel Hilliard and his business partner: "In connection with their farming business Mr. Samuel Hilliard, and Mr. Norton P. Lore, Sr. get a fine quality of glass house sand from their farms which they have washed, and they ship it to different parts of the country." Local journalist Jean Jones had an opportunity to transcribe some old letters that were discovered in Frank Wheaton's attic. She found several pieces of correspondence belonging to a young man who worked at Hilliard sand mines. Jones smiled and said the "forlorn letters" indicated this young man was apparently smitten with a local young lady. Julie Smalley, who spent her summers on nearby Acorn Island, remembered a small dwelling near this reach of the Maurice River. This tiny structure that Smalley mentioned sits on the pilings at river's edge, and is not the yellow residence by which this reach is referenced. The trailer that Smalley described was small, "like a trailer," she said. "And it was yellow," Smalley said. She had no idea who used the structure - or for what. Jane Galetto had first-hand knowledge of this dwelling. Galetto said that not long after they were married (1980), she and husband Peter decided that they wanted to build their family home near the water. They studied maps and explored the land around the rivers, streams, lakes and ponds in the area. "My husband was very familiar with the Maurice River," Jane Galetto said. "His father and some friends had a place called the Polenta Hotel. It was a little shack down the river." Galetto said that a group of hunters, many of Italian heritage, would go hunting and then gather with their cronies at the little yellow cabin to visit and share a meal. The main feature on the impromptu menu was usually their homemade polenta or crabs and spaghetti. 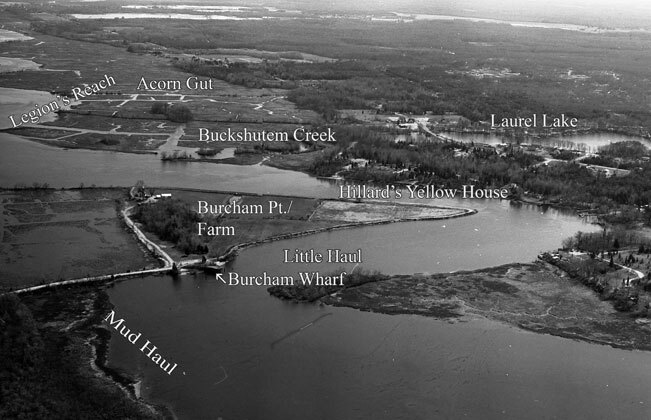 Janette Burcham relayed to Jane Galetto that the sand company had a yellow building across the river from their property and might be the source of the name Yellow House Reach. Radio Shorts To learn more about the Maurice River, check out CU's podcasts.